Adverts work - that's why the food industry spends so much money on them. The more junk food ads young people see on TV, the more they eat – and that could amount to over 500 extra snacks throughout the year! There is no silver bullet to reduce obesity, but there is overwhelming evidence that junk food marketing impacts children’s eating habits. Putting a stop to junk food ads on TV before 9pm, and similar restrictions online, can help protect future generations by protecting kids today. Join our campaign by telling us why you support protecting kids from junk food ads. Why campaign on childhood obesity? Being overweight or obese is the biggest preventable cause of cancer in the UK after smoking. In fact, obesity is linked to 13 different types of cancer. Over one in five children in England are overweight or obese before they start primary school. By the time they leave, this increases to over one in three. Acting early is critical - obese children are more likely to grow into obese adults, and obese adults are more likely to develop cancer. Why do you want to protect kids from junk food ads before 9pm? The UK Government must take action to tackle junk food marketing and price promotions on items high in fat, salt and sugar (HFSS). A strong childhood obesity plan will give children a better chance to eat healthily, stay a healthy weight and avoid cancer in later life. update current rules to better reflect what children watch on TV by extending existing regulations to restrict junk food ads before the 9pm watershed. include on-demand and online viewing within the same rules – to make sure young people are protected however they watch programmes. introduce legislation to restrict multi-buy price promotions on HFSS foods - e.g. ‘buy one, get one free’, ‘three for the price of two’, and ‘X for £Y’ offers. The Government have set out a bold ambition to halve childhood obesity by 2030 in its newly updated plan. It says it will do this in many ways, most importantly through tackling how junk food is marketed at children and families. Proposed measures include a potential ban on junk food adverts before the 9pm watershed with similar protections online and a ban on promotions for foods high in fat, salt or sugar in shops. We’ve been campaigning on this for a long time across the UK - this shows that the Government has been listening. The Government will gather opinions from the public, health bodies, food and drinks and advertising industries, on what the ban should look like before the end of the year. We know there will be a big push back from industry, but the evidence is strong. Adverts for junk food on TV make a difference to the foods children prefer and choose to buy (or pester their parents into buying) – often without them even realising it. Junk food adverts are already banned on kids’ TV but not on mainstream family viewing. Restricting these adverts on TV won’t solve the obesity problem but not allowing them to be shown before 9pm can only help. We need to keep up the pressure to make sure the plan isn't watered down or forgotten. Sign up to be a Cancer Research UK e-campaigner today to make sure new campaign actions and updates are delivered straight to your inbox. How are junk food ads a problem? We showed some primary school children a range of adverts that were designed to appeal to them or were shown during family shows on TV. Their reactions show how adverts work - that's why the food industry spends so much money on them. The more junk food ads young people see on TV, the more they eat – for some, that could be over 500 extra snacks in a year. We need a 9pm watershed on junk food adverts on TV and similar restrictions for online and on-demand. Being overweight increases the risk of 13 different types of cancer. Being overweight or obese is the biggest cause of cancer in the UK after smoking. It causes around 22,800 cases of cancer in the UK every year. The Cancer Policy Research Centre (CPRC) have a vision of a healthier population who avoid more preventable cancers. Their research provides the evidence needed for the Government and Ofcom to take action. 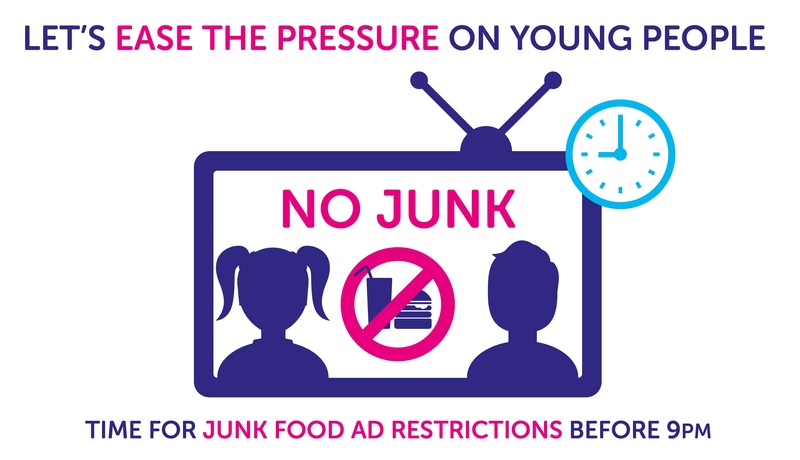 In 2018 the CPRC have released a series of reports on the impact of junk food ads on young people in the UK. We campaign for change to improve early diagnosis, treatments and even help prevent people developing cancer in the first place. Together, we will beat cancer. Scotland’s obesity levels are the worst in the UK - the Scottish Government want to change this. We're campaigning to Scale Down Cancer in Scotland, find out how you can get involved. Cancer Campaigns Ambassadors volunteer to take our political campaigns to their local community. Could you help us persuade politicians to support better cancer policies?